The HPE 6Gb/s SAS BL Switch for HPE BladeSystem c-Class enclosures is an integral part of HPE direct connect SAS storage, enabling a shared SAS storage solution. The SAS architecture combines a HPE Smart Array P711m, P712m (with cache module), P721m or P731m Controller in each server and 6Gb/s SAS BL switches connected to supported HPE storage enclosures for SAS storage. The 6 Gb/s SAS BL Switch contains an embedded Virtual SAS Manager (VSM) GUI & CLI interface used to zone, monitor, and update SAS fabric devices. Shared SAS: The 6 GB/s SAS BL Switch can be used to access shared SAS storage provided by the P2000 G3 SAS array system. A HPE Smart Array P711m, P712m (with cache module) , P721m or P731m Controller installed in each server acts as a pass-through, with RAID functionality for shared SAS storage provided by the P2000 G3 SAS array system. The P2000 G3 SAS array system creates a shared storage environment where more than one blade server can access a storage logical unit. Zoned Direct Attached Storage: Use the Virtual SAS Manager of the 6Gb SAS BL Switch to zone groups of drive bays in the MDS600, D2000 (D2600/D2700) or D3000 (D3600/D3700) and assign them to individual blade server bays. A HPE Smart Array P711m /P721m/P731m Controller installed in the server provides RAID functionality for the group of SAS and SATA drives that have been zoned to that server. The logical drives provided by the P711m /P721m/P731m Controller will appear as local drives to that individual server. The P711m/P721m/P731m offers load balancing and fail over anytime dual paths to dual-ported SAS drives are available when using two HPE 6Gb SAS BL Switches cabled to a MDS600 configured with the HPE MDS600 Dual I/O Module Option Kit or to a D2600/D2700 or D3600/D3700 or D6000 configured with dual IO module option kit. 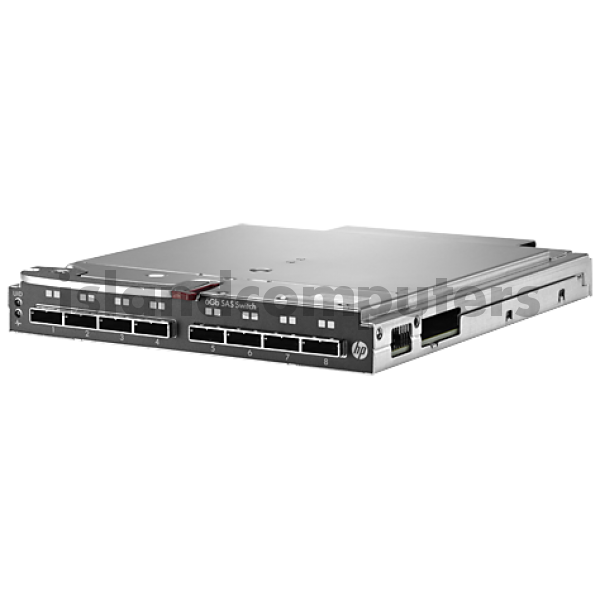 Do you have any questions about BK763A HPE 6Gb SAS Switch Single Pack for HPE BladeSystem c-Class?